I don’t know… It feels a bit early to pull out the red and green fabrics since we only just got past Halloween, but then yesterday I noticed that the stores already have their Christmas candy on the shelves, so maybe the time is just right! The other day I had an urge to sew with a little red and green, so I decided to go for a smaller project – namely these fun potholders. I don’t own any actual Christmas themed fabric, but I do have lots of red and green fabrics, and I kind of think it’s fun to use these to give a Christmas-y look. 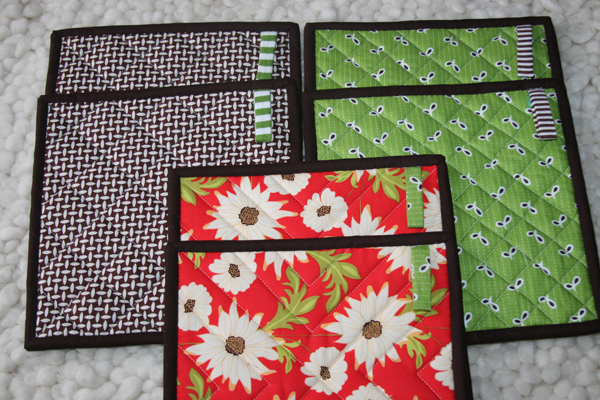 I paired the red and green with some chocolate brown and made up a few string block potholders and a couple that feature improv blocks. 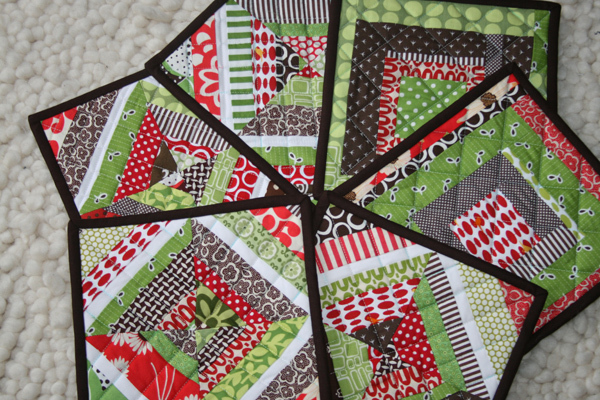 Each are paired and have a matching backing fabric, along with a cute matching hanging tag. They each measure about 8 1/2″ square and use one layer of Insul-Brite and one layer of cotton batting. The string block sets are listed in the shop (sold, thank you!) in case you’re planning ahead and looking for a little holiday gift! This entry was posted in Household Goods, Household Sewing - bags, napkins, pillows and tagged christmas, gift, handmade, improv blocks, potholders, quilting, red and green, string blocks. Bookmark the permalink. 25 Responses to too early? Definitely not too early! These are lovely and will make wonderful gifts. very cute! i love the addition of the brown. these are great! 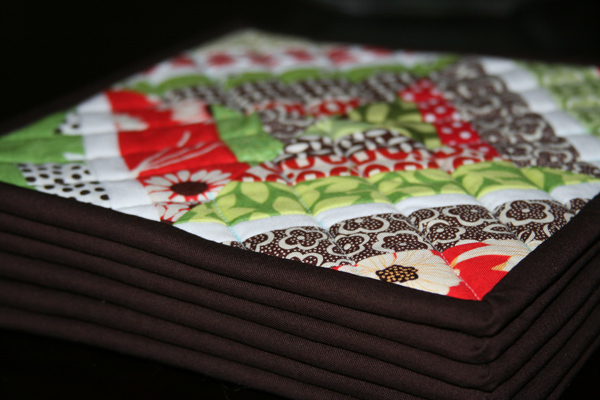 Do you do your binding on these just like a quilt (by hand on the back)? or do you machine stitch the binding? How do you layer the insul-brite — towards the back or the front? The insul-brite should go towards the side where the most heat will be. I put mine with the shiny insul-brite side towards the backing. I do pieced top, insulbrite, regular batting, and then the backing. Not too early. 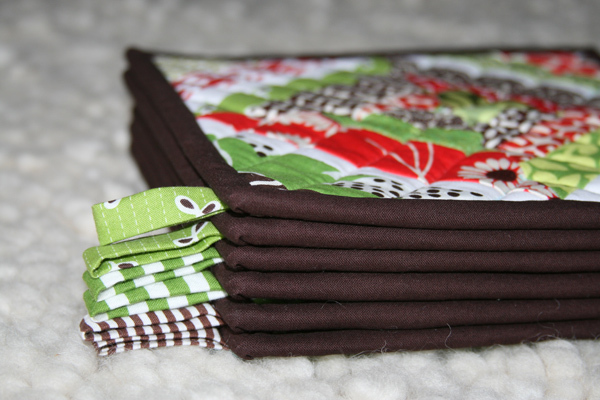 I’m making Christmas presents this week, including making matching potholders and towels out of the Christmas fabric that’s been hanging out around here for the last couple of years. I love, love these! And I’m pretty sure I’d use them all year round. What a perfect gift! I’m impressed with your organisation! I’ve just about accepted that christmas is coming, but actually picking out red and green fabrics is far too organised. Not too early and the brown is a great addition! Those are so cute, and I love the addition of the chocolate brown – inspired!! Sew not to early! I’m actually feeling behind because i haven’t posted a Christmas Tree skirt tutorial that I have in the works. It’s going to be posted early/mid November – I hope that will give everyone enough time to complete it before the holidays! I say now’s the time for inspiration!!! Definitely NOT too early for these! I adore them. 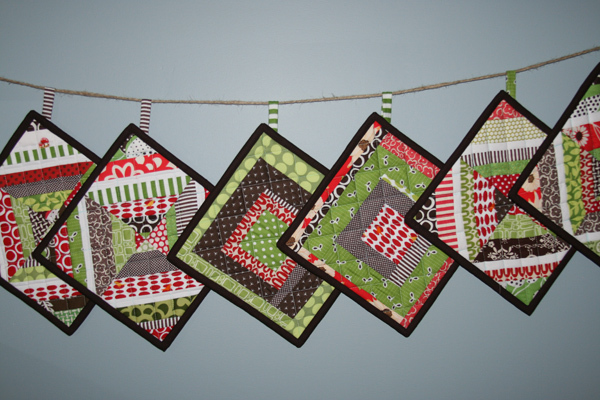 I love that you made them in reds and greens but not in Christmas fabrics. And that brown binding is just perfect. I would love to add these to my list of things to make for gifts, but I know I’ll never get to everything. Might have to stop by your shop to see if these are still available. Very fun to gift handmade gifts that are handmade by my friends! No, not too early. You’re just reminding me that I’m already behind! Those make me realize that Christmas is right around the corner. That and the fact that the kids and I just counted the number of days in the car last night. I better get busy. You already have. Really, really love the colors! you know, i’m glad you posted these when you did. it gave me time to make potholders for several family members for christmas. they all loved them, and now one aunt wants to try making her own! thanks for your continued creativity, it’s very inpsiring!